Astilbe Visions in White produces large beautiful white flowering plumes in midsummer that sit atop dark green foliage that is smooth and glossy. Visions in White grows up to 24 inches tall and 18 inches wide, this shade loving perennial is at home in woodland gardens, rain gardens, or growing in containers. It prefers moist to wet soil. Leave the seed heads on the astilbe plant for winter interest and to feed birds through cold weather. 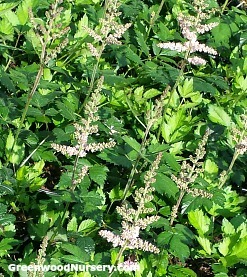 Astilbe Vision in White is a one gallon container grown plant.